JazzCash introduces ReadyCash loan service that will process and issue you a loan in a few seconds! ReadyCash is an instant and convenient way for JazzCash Mobile Account customers to avail short-term instant loans of small denominations. ReadyCash service will instantly credit loan into your Mobile Account allowing you to utilize the amount instantly to meet your short term loan requirement. With ReadyCash, customers no longer need to go through heavy documentation or processes to get a loan. With a few taps on your mobile phone, ReadyCash is your instant loan! Customers can avail ReadyCash service for a duration of four weeks; with the option to pay back early as well. One customer can get only a single loan at a time of up to Rs 1,000. Currently, the service is in pilot and is available for a limited number of customers only – who will be informed about their eligibility through an SMS. Note: Currently ReadyCash is available to a selected customer base who will be informed about their eligibility through SMS. ReadyCash will soon be available to all customers. How to get ReadyCash Loan? How to Repay ReadyCash Loan? Note: Alternatively, JazzCash will automatically deduct total amount + applicable fee on the due date; all you need to do is keep the required balance in your mobile account for this payment! What is the minimum and maximum ReadyCash amount that can be availed? You can avail loans ranging from Rs 50 to Rs 1,000 depending on your eligibility. Are there any additional charges except the weekly fee? JazzCash will not charge any additional charges such as loan processing fee or any other form of charges except for a weekly fee for availing ReadyCash loan. Can the due date for ReadyCash repayment be extended? Customers must pay back their loan within 4 weeks, in case their repayment is late; JazzCash will automatically extend their due date by a week (up to maximum of 4 weeks). How many ReadyCash loans can customers avail at a time? You can only have one active ReadyCash at a time, but once the loan has been repaid, you can apply for another loan again. How to Repay your ReadyCash? What if customer fails to repay loan even after the revised due date? If repayment amount is still owed after the due date, the due date will be extended automatically for one week and for a maximum of four weeks. If customer still does not repay the ReadyCash loan in full, they will be blacklisted from availing ReadyCash service in future and will also be reported as a defaulter to the State Bank of Pakistan through eCIB system. How can I deposit money into my Mobile Account in order to repay ReadyCash? 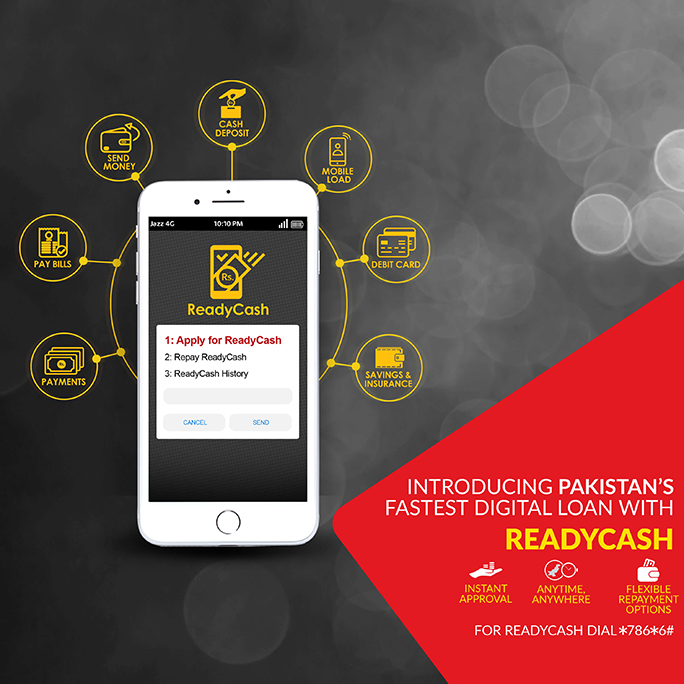 By choosing to use this ReadyCash Service (“SERVICE”) you agree to establish a direct contractual relationship with Mobilink Microfinance Bank Limited (“BANK”) as a customer/borrower and you further agree to be bound by the BANK’s terms and conditions of use of the SERVICE and undertake to repay the ReadyCash loan amount along with all the due charges on the agreed date and time. 1.1. Customer should have a JazzCash mobile account. 1.2. Customer has active mobile account Usage. 1.3. When you apply for a loan, you instruct, consent to and authorize Mobilink Microfinance bank for considering your ReadyCash loan service. 1.4. When you apply for a loan, you consent the Bank to access certain information about you for offering ReadyCash Service. This may include information relating to your Jazz mobile subscription and JazzCash Mobile Account. 1.5. Once customer’s ReadyCash loan request is approved, ReadyCash loan will be disbursed directly into your mobile account and an SMS confirmation will be sent. 1.6. The BANK shall not be required to provide reasons to you for declining or approving your application for a ReadyCash loan. 1.8. These terms and conditions may change over time and will be available on JazzCash website. Therefore, whenever you are requesting for ReadyCash loan you need to review these terms before you apply for a ReadyCash loan. 2.1. You can repay your loan using mobile account at any time on or before the due date, by selecting the Repay ReadyCash option. 2.2. The Bank is authorized to process automatic deduction of the repayment amount of outstanding ReadyCash amount from your mobile account after due date, automatic deduction can be processed one or more times until repayment of the outstanding balance plus applicable fees has been made in full. 2.3. After eight weeks since loan disbursement, there will be no further weekly fee applied on outstanding ReadyCash loan amount. 2.4. The loan amount would automatically be deducted from mobile account after the due date (four weeks). 2.5. Customer authorizes Bank that they may receive notifications/alerts regarding their ReadyCash loan.